Universal Forest Products continues to grow and prosper in its location in the Briar Patch since it set up shop in 1988. 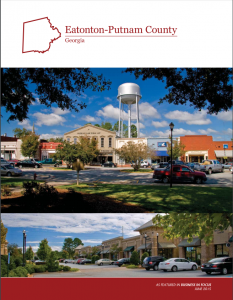 The Eatonton location has increased its sales by 28 percent and is anticipating 18.6 percent growth next year, General Manager of Operations Jason Settles told The Eatonton Messenger, adding that its workforce increased by 20 percent and is expected to increase another 16 percent. Universal Forest Products Inc. or UFPI, is a leading manufacturer and single-source supplier of wood, wood alternative products and engineered lumber for the retail, industrial and construction markets. The publicly-traded company is headquartered in Michigan and has approximately 100 facilities in the U.S., Canada, Mexico, Puerto Rico and Australia with a total of about 8,000 employees and $2.9 billion in sales in 2015. The 54 employees in Eatonton, which includes sales and office staff, build wooden boxes, crates, skids, and pallets for big industries to ship and store their products, and roof trusses for Legacy Housing. “We’ll run 35-40 million feet of lumber through here in a year,” Settles said, figuring the statistic in his hea then confirming on a calculator. Universal Forest Products of Eatonton General Manager of Operations Jason Settles inventories wood outside the local plant. When Legacy Housing purchased and set up shop in one of the old Horton facilities in February, UFP got back in the truss-building business again. Currently, new roof trusses are seven to 10 percent of Eatonton UFP’s business, Settles said. 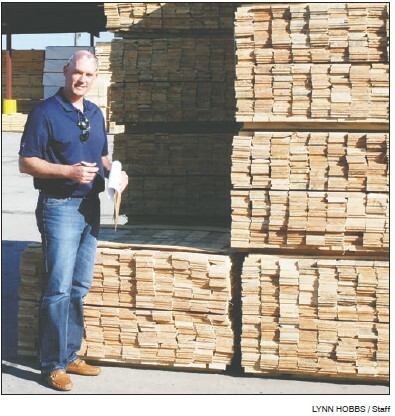 They purchase almost all of their lumber for production from Interfor lumber company in Putnam County and Pollard Lumber in Appling, Settles said, and UFP employees cut it into the desired measurements and rout it out. The finished product is shipped within 24-48 hours of taking the order, Settles said. UFP had been renting its facility from Horton since 1988 and was able to purchase it at a tax auction in September 2015 for $135,000. Since purchasing the facility, UFP has invested $1 million in capital expenditures around the production area, which totals 55,000 sq. ft., according to Settles. 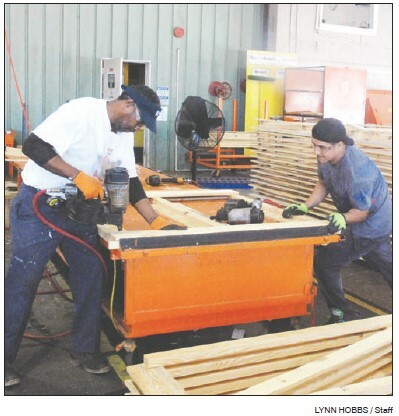 Luther Butts, left, and Oscar Bravo-Salvador work on the production side of Universal Forest Products of Eatonton recently. “The people are proud we want to provide them a safe work environment and provide opportunity for them to provide for their families,” the GMO said, noting one employee has worked there 30 years, several others have been there more than 20 years and a lot have been there 10 years.